Last year Google made a HUGE change to its algorithm which has affected search ranking on millions of websites. Has it affected yours? Are you aware of what I’m talking about? Here’s the deal: On April 21, 2015 Google started dinging sites that aren’t mobile-ready so they cannot be found on searches by folks on a mobile device. At this point in history, mobile use has risen so quickly that about half of all folks searching are doing so from a mobile device. So even if you were a star SEO person (or you hired one) who make sure your site came up on all pertinent searches in your demographic, unless your site is mobile–ready, you can’t be found by folks on a mobile. There are a few things you can do to fix this right away. Google will tell you instantly whether your site is mobile ready or not. If you passed the Google test, skip to Step 4. If you failed the Google test, you need to make your site mobile-ready asap. If you’re on WordPress already, go to Step 3. If you are still on an HTML or some other platform (not WordPress) go to Step 5. If you are on WordPress already and failed the mobile-ready test, there are simple plug-ins you can add to your site yourself or have a professional help you, that will make your site reasonably mobile ready, at least as far as Google is concerned. Remember to always back up your site before installing any new plug-ins in case what you do messes up your site in some way (it happens, sorry to report). Visit https://wordpress.org/plugins/tags/mobile-plugin then choose a plug-in and follow the instructions to implement it, or talk with your VA about installing it. Or go to Step 5 to receive help from me and the Magical Marketing team. If you passed the mobile ready test, you should still go on a smart phone, or use a site like this [http://mobiletest.me] to check several platforms and see out how your site looks and works on a mobile. Current trends show that over 50% of online consumers are using mobile phones at least some if not all of the time to search for products and services. Often even if your site is somewhat responsive, it may not function that well on a mobile. How does your site look and respond on a mobile phone or tablet? Is your site banner responsive? Does it look good on the mobile phone or do you need a new banner for the mobile site? Is your Navigation bar too big or does it change nicely to a mobile-friendly one? Most mobile-friendly nav bars will change to a ‘hamburger link’ (3 horizontal lines) which when clicked reveals the entire menu. This saves space on the tiny mobile screen. Is your text a legible size on a mobile device or is it too tiny to read? Are your widgets still on the page (they usually drop to the bottom of the page) or did they disappear? Overall, is the user experience as good on the mobile as on your desktop site? If you feel your mobile site is clunky, has weird spacing, or is simply not as beautiful or user-friendly as your regular site, Magical Marketing can help. Go to Step 5. How Magical Marketing can help make your mobile site Wildly Attractive! For folks getting a new website with us, we include mobile responsiveness on all our website design and production packages. We also have some frugal options for making your site mobile ready without a total re-haul. If your site failed Google’s test or your own mobile review, then I’d like to help you right away. I will be talking to as many of you as I can during the month of April to make sure your site is ready for this mobile revolution. 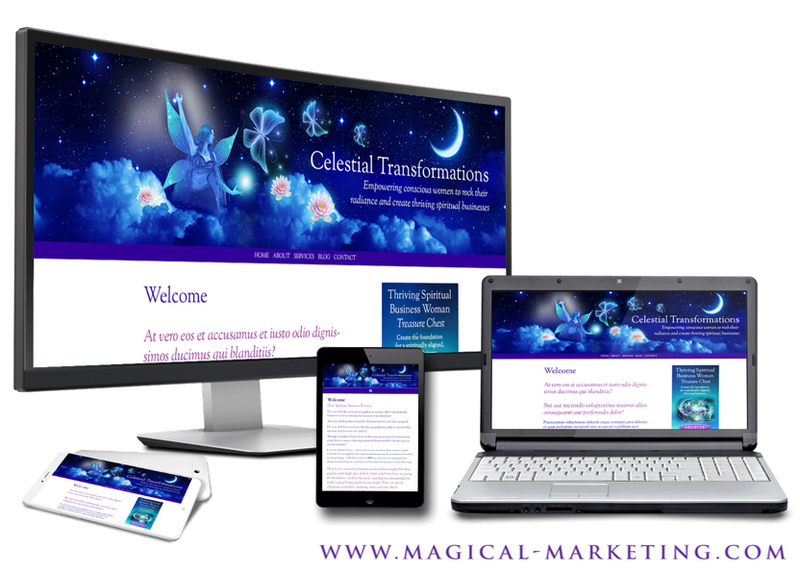 To get into my calendar, please apply for a complimentary Magical Website Analysis with me. We will take a few minutes to go over your site both on the desktop version as well as mobile, and come up with a plan of action for you moving forward. To apply for your session, visit http://www.magicalwebsiteanalysis.com and fill out my little form. I’ll be back with you within a day or two to schedule. The changes in the industry are really exciting. More and more people are going to be able to find you instantly as they roam around with their mobile phones. The key is to be prepared and make sure your site attracts and engages your tribe no matter where they are in the world, through their mobile devices. It’s really important that your site be mobile-ready. The whole world is changing. Apply for your website review with me and we’ll work out a plan.